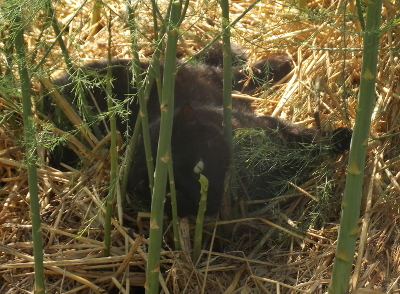 Huckleberry helped me harvest the garlic Monday, which is a bit later than we usually dig the alliums up. The cold winter really set our garlic back, and I was hoping that a little extra time would help the heads grow larger. Of course, I know better --- a little extra time just means the outer wrappings start to rot away and the garlic won't keep quite as long. What happened? 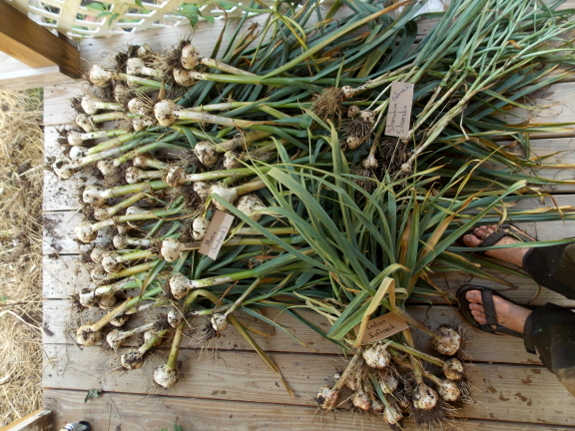 The extremely cold weather set the hardneck garlic back so it didn't do much growing until spring, but the temperatures actually killed over half of the softneck plants. I'd be curious to hear from garlic-growers in zones colder than 6. Do you plant your garlic in the spring, plant late in the fall and mulch heavily to ensure the plants only put out root growth during cold weather, or stick to hardneck garlics? I experienced the same thing here in zone 7b. I usually plant softnecks in October / Novemeber. This year I planted 36, which should have been enough to eat and save for planting again in the fall. However, I just harvested and only 8 survived (that's only 22$ survival) and only one of those had any size to it. This'll be the first time in several years that I'll have to buy garlic at the grocery store! I've been planning to switch to hardnecks so that I can try the scapes, but if they're going to perform better anyway... Well, I'm looking forward to hear how you like the flavor of the music variety. I live in Michigan in zone 5b, although we got to 4b temperatures for about two nights and 5a temps for more than a week. However, we had extensive snow cover (about a foot). My hardneck garlic (all i've ever grown) has done wonderful. It had about 6 inches of top growth going into the winter. I am still a week or two to harvest, so all I have to go on is top growth. My peach tree did not fair so well. All blossom buds killed, and about 90% of the leaf buds & 80% of branches were killed. Similar for Redbud trees. The snow definitely acts as an insulator! Zone 4a but I'd argue I've a microclimate that is easily 4b if not 5 next to the house. Garlic is planted in 4a area though. Hardneck, goes in October, harvested in a few weeks from now or so. I plant an old Armenian variety, I'd have to dig through my notes for the proper variety name. It is excellent and a real workhorse. I planted 30 cloves of Music (hardneck) the first week of Oct in zone 6b. We had a lot of heavy freezes that took out almost 50% of our berry patch (they were only 1 year olds). Nov 11th: a clove that I dug up had 20-30 roots that were about 1" long. Dec 16th: Each had 1" of new green growth. This is when I put about a 2" layer of partially composted chicken bedding on them. Jan 2014: On unknown date, the green growth died back. March 21 2014: Growth was about 8" high and each plant had 2-3 leaves. 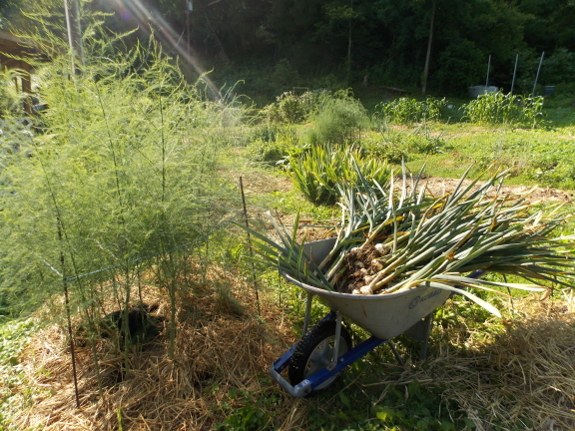 May 2014: Scapes all month long. Stored in a mug of H20 in the fridge, they lasted for up to 3 weeks. Currently (Jun 24th): Bottom 1/4-1/3 is yellowed, and each plant has 8-12 leaves. They are ready to pull, but I am waiting for dry weather. All 30 cloves produced nearly identical sized plants. Seed source was Territorial Seed. Music is the main garlic grown commercially in Ontario - most of which is zone 5 or colder. Research by a local university has shown that the yields are significantly better for hardneck planted in the fall than for spring planted softneck. The need for mulch is still being argued over. I plant mine - hardneck of various varieties - in October or November aiming for after the first frost and a time when it's not too wet. Mine is fabulous this year after the coldest winter in decades. Harvest will be sometime in July.